I’m bored with biopics, those stylized film biographies that attempt to condense the life of someone famous down into a two-hour Oscar bid. True, traditional Hollywood biopics tend to have the showy star turns and epic-sized production values that make for reliable Oscar bait, but the movies themselves are usually predictable and often outright dull. If you have even a passing knowledge of the film’s subject, it’s hard not to feel manipulated by the Cliff Notes psychology and short-circuited exposition often at work in a conventional biopic. Jamie Foxx as Ray Charles? Russell Crowe as John Nash? Denzel Washington as Malcolm X and Hurricane Carter? Good turns by all. Still, I suspect that Lawrence of Arabia and Raging Bull hold up as two of the greatest biopics of all time because they were made by artists pursuing an original vision—not an express line to the Oscar podium. When biopics detour from the genre’s plodding conventions for a more subjective interpretation, they’re often pilloried for their efforts (Marie Antoinette and Fur: An Imaginary Portrait of Diane Arbus being two recent, if flawed, examples). The latest to subvert expectations is I’m Not There, which imagines the mercurial life of Bob Dylan through six different actors, including an African-American boy and Hollywood’s go-to junior Streep, Cate Blanchett. Director Todd Haynes’ trippy anthem to the hometown folk-rock god opens locally November 21, but it screened last night at the Walker, where it was introduced by Haynes’ longtime producing partner Christine Vachon whose films (Safe, Far From Heaven, Happiness, Kids, Boys Don’t Cry) are often unapologetically outside the mainstream. Sound viewing advice for the crazy quilt that is I’m Not There, a fascinating piece of cinematic showmanship in which Haynes answers the question: How do you represent music’s most inscrutable shape-shifter? He started by casting six actors to either play Dylan, Dylan as interpreted by an actor playing a Dylan character, or in some cases merely an aspect of Dylan’s personality or influences. 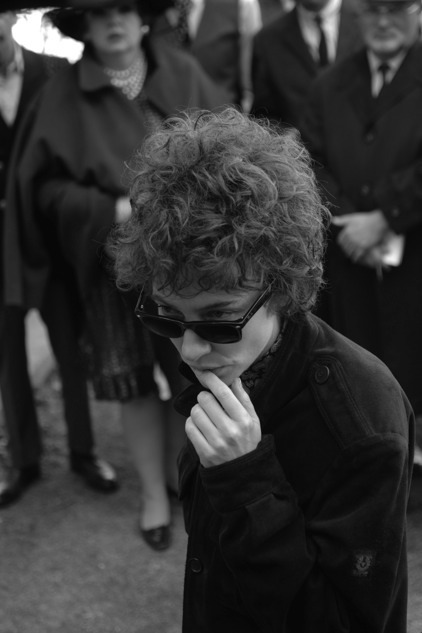 Each character has his own storyline, which Haynes shot in a period-specific film stock and style (black-and-white a la Fellini’s 8 1/2 for the Don’t Look Back–era Dylan; 16mm for early Greenwich Village folk-scene Dylan) and to which he’s scored thematically appropriate Dylan songs and scripted dialogue sampled heavily from the great man’s catalog of famously elusive one-liners. Christian Bale plays both the soft-spoken early sixties folk singer Dylan and also the Born Again evangelical Dylan of the seventies. Heath Ledger has the role of a womanizing actor (playing Bale’s Dylan) who is married to a character loosely modeled after Dylan’s first wife, Sara Lownds. Marcus Carl Franklin is a rail-riding hobo named Woody (Guthrie, of course), and Ben Winshaw is a teenage Arthur Rimbaud. Richard Gere, in the film’s weakest narrative thread, is a hippie outlaw Billy the Kid who has retreated to the sticks, dropping out as Dylan did after his motorcycle crash. The actor everyone will be talking about is Cate Blanchett,inhabiting the petulant rock-star Dylan of the late sixties who delights intearing down everyone around him even as he’s booed by audiences who feelbetrayed by his newly electrified music. Blanchett delivers a gutsy,exhilarating performance that is finely calibrated to the film’s surprisinglycheeky tone—and her performance alone is worth the price of admission. The actor everyone will be talking about is Cate Blanchett, inhabiting the petulant rock-star Dylan of the late sixties who delights in tearing down everyone around him even as he’s booed by audiences who feel betrayed by his newly electrified music. Blanchett delivers a gutsy, exhilarating performance that is finely calibrated to the film’s surprisingly cheeky tone—and her performance alone is worth the price of admission. Nothing is conventional about Haynes’s approach. He jumbles time rather ruthlessly and marries metaphor and biography in over-the-top fantasy sequences that will doubtless irritate even those Dylan nuts who know what they’re getting themselves into. The biggest surprise for me (no Dylan-phile, by any stretch) was how thrilling all this is to watch. Haynes’ artistry is all over the screen. And despite the film-geek touches and parade of name actors, I’m Not There manages to be massively entertaining, unpretentious, and bold in a way few biopics (and frankly few films) rarely are. “I really think people are experiencing biopic fatigue,” Vachon said when she returned to the stage after the screening to answer questions and trade barbs with an audience member who called the film "cartoony." I’m Not Here, as with all art-house fare, will have to find its legs in an oversaturated market, but Vachon says she thinks audiences will appreciate a film that turns the whole idea of the Hollywood biopic on its head. She’s peddling a very peculiar film, so there’s no telling if this is the one to change their minds, but I sure hope it gets the chance.